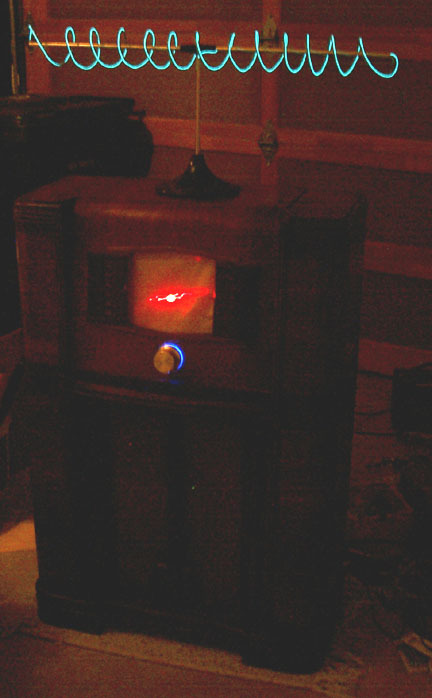 For Burning Man 2004, my project was an antique radio which receives emissions from nearby quasars (quasi-stellar radio sources). 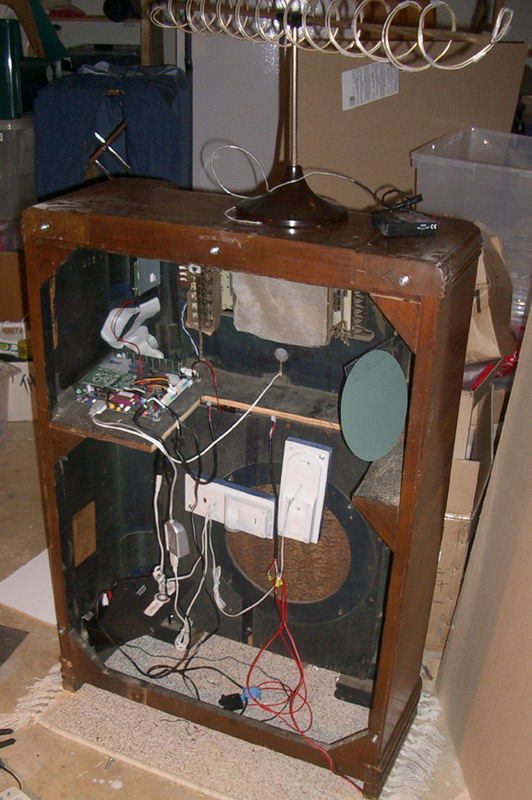 A computer inside is generating the radio station sounds, using a phython script which controls a chain of VST plugins for audio processing. In addition to being heard, the sounds directly control the wild gyrations of a laser display, reflected onto the glass of the radio dial. Visitors tuned into a near-infinite selection of radio stations, by turning a large silver knob. 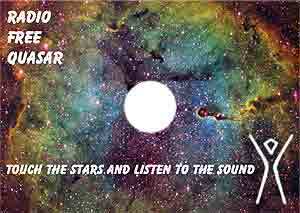 Rick Ehrhart and I put together a little mini-CD with a few tracks of audio from Radio Free Quasar. To listen to the tracks, click on the mp3 files to the right. 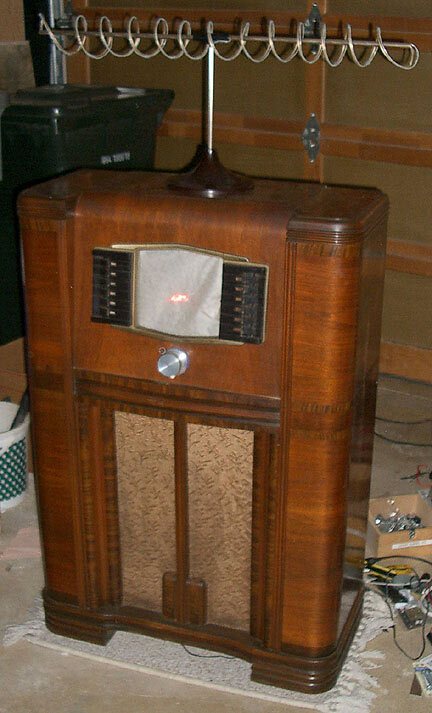 Step 1 - Obtain antique radio from ebay. Step 2 - Install audio-controlled laser display. 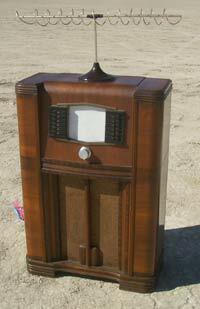 Add a mirror to reflect the beams onto the radio dial. Step 3 - Replace the radio dial with a sheet of paper, so the laser beams are visible. Step 4 - Install fanless low-power computer, with a dc-dc power supply so that it can be powered from a 12 volt battery. Step 5 - Add deep-cycle 12volt battery, with a power sequencer to help turn the computer on and off reliably. Step 8 - Obtain funky antenna from ebay. Step 9 - Wrap antenna with el-wire. Step 10 - Write python software that takes wav files and processes them randomly with VST plugins. Step 11 - Add a back cover to the radio so it stands some chance against the elements. It looks like this at night. 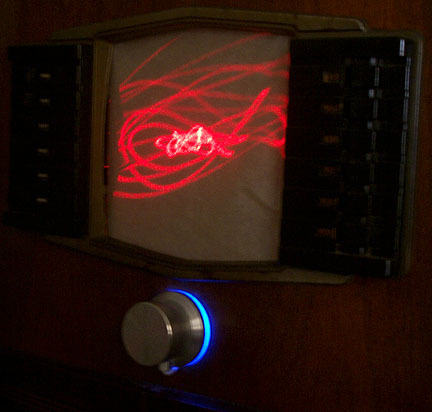 A closeup of the radio dial laser display. A view of the inside, showing the computer and disk in the upper-left corner, laser in the lower-left corner, speakers in the middle, and the circular mirror in the upper-right corner.